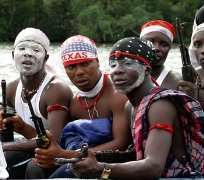 Members of Movement for the Emancipation for the Niger Delta in Nigeria's Niger Delta area, Nigeria's biggest armed group has rejected the latest offer of amnesty by President Umaru Yar'Adua. The Movement for the Emancipation of the Niger Delta said on Friday it will continue the violent campaign until the 'injustice' done to the oil-region is corrected. In a swift reaction to President Umaru Yar'Adua's new offer of amnesty to militants in the Niger Delta, MEND said the crisis can be resolved if the authorities resolve to address the root causes. "The very reason for militancy is because of injustice," the group noted in a letter addressed to President Yar'Adua. Since the 1970s, Nigeria, Africa's biggest oil producer, has pumped more than $300 billion worth of crude from the southern delta states, according to official estimates. But high unemployment in the delta, environmental degradation due to oil and gas extraction, and a lack of basic resources such as fresh water and electricity have angered some of the region's youth and incited them to take up arms. A Niger Delta researcher and writer, Akpomujiaga Ojeh, said a more equitable distribution of oil revenues could be the catalyst for peace and stability in the region. "Government, in general terms, must do what is right by bringing the presence of justice in terms of equitable distribution of the revenues accruing from the resources produced by this people," he said. "Government should look for a procedure, by law, to send down proceeds of the oil revenues which they take from this area down to the people. The people need to get a recompense for the exploitation of these resources," Ojeh added. The government announced Thursday that details of the amnesty program will be announced in two weeks time. Analysts said amnesty and demobilization of militants offers an opportunity to reduce violent conflict in the Niger Delta, but a lot more could depend on how quickly the government moves to fulfill its pledge of massive development of the region. The past three years have seen an upsurge in militant activities in the region with frequent attacks on the oil industry. MEND claims to be fighting for a greater share of the oil wealth for impoverished communities in the Niger Delta. Dozens of soldiers and militants were killed in the past three weeks in clashes as the army launched its biggest offensive against militants in the region.